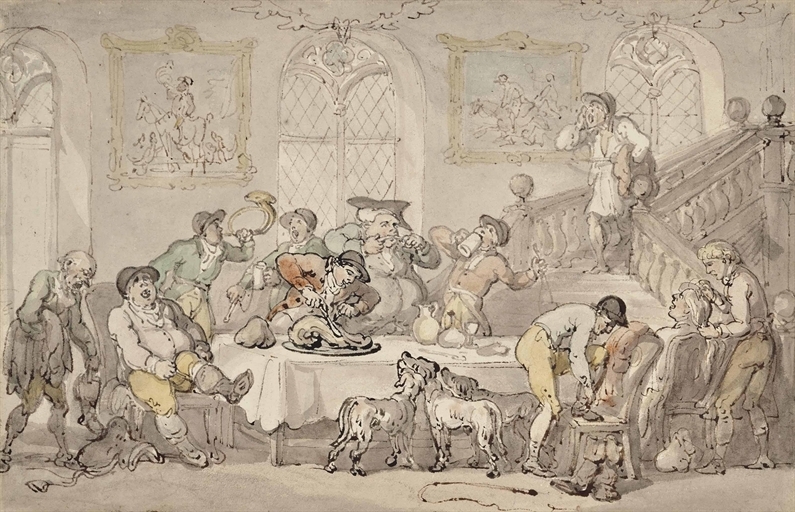 Thomas Rowlandson, The Hunt Breakfast, Ink and watercolour, n.d.
Sports, socialising and shagging constitute the holy trinity of themes which underpin Thomas Rowlandson’s work as a satirist. This undated watercolour, which will be going under the hammer in a major London saleroom in a couple of days, presents the viewer with an admirable example of the first two of Rowlandson’s main preoccupations. The picture shows a group of well-to-do young gentlemen enjoying a riotous breakfast, largely served in liquid form, prior to setting out for a morning’s fox hunt. At the centre of the scene we see a group of early morning revellers indulging in ham and ale to such an extent that their ability to remain upright on their horses must surely be a matter of some doubt. A collection of servants fuss round the periphery of the group, tending to the more sober and diligently attired members of the party. Meanwhile a latecomer, presumably still shaking off the effects of last night’s pre-hunt drinks, stumbles down the stairs in his nightgown with his clothes under his arm. The trio of dogs, who ignore both the huntsmen and the viewer with equal diligence and stare longingly at the breakfast ham, constitute another example of a stereotypically Rowlandson-esque motif. Rowlandson was no stranger to hunting or to the kind of well-appointed country houses that are depicted in this painting. 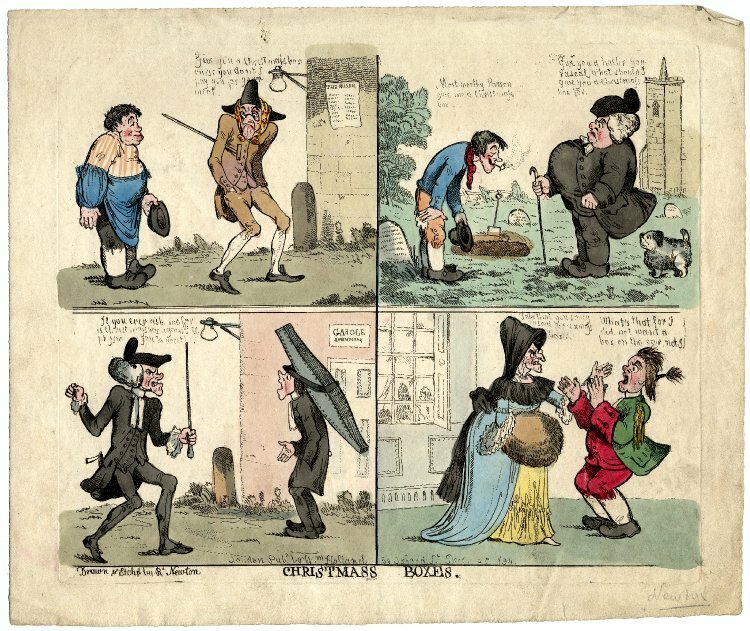 His friends and fellow caricaturists John Nixon and Samuel Howitt were both fortunate enough to own modest country piles. Howitt in particular may well have staged many parties which resembled the scene depicted above. He was the scion of a family of wealthy City cloth merchants who were determined to elevate their eldest son to the ranks of the idle rich; it was an ambition which Hewitt lived up to admirably – squandering his entire inheritance in a few short years of lavish parties and endless indulgence in country sports. 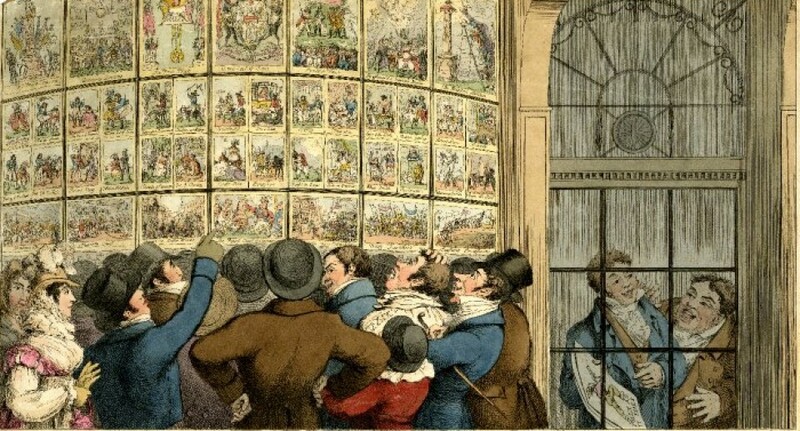 His profligacy would eventually force he and his wife Elizabeth (Rowlandson’s sister) to relocate to London and attempt to find work as a jobbing artist and illustrator.